You are a team leader who wants to level up into a Director or VP role. You have the skills necessary to execute your current role and you’re hungry for more. You want to create a larger impact and grow yourself. Get started and Apply today. The problem today is everyone wants more but only few are willing to put in the work. How do you stand out from everyone else? How do you show your growth as a leader? How do you level up in a predictable way? You know about the courses and workshops, they are great for working on one isolated concept but not for leveling you up start to finish. With ephemeral methods like books, courses, workshops there is no continuity, no accountability, no one to walk through the process with, no one to ask questions to ask you apply the knowledge in the real world and no one to guarantee your success in your goal: leveling up. 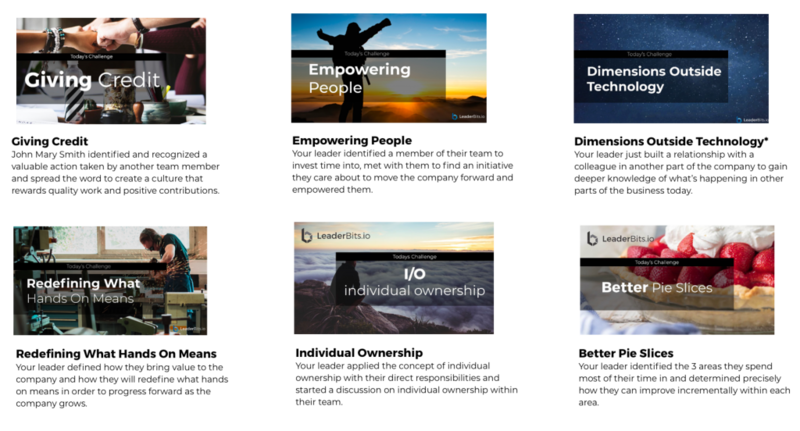 We’ve created an action based world-class leadership program that we guarantee will level you up in 12 months or we give 100% of your money back. How is this different than other leadership programs? The program is broken up into small weekly actions you take. These actions compound over the program and your peers will begin to see you as a leader. It makes sense right? You will take action with advice from the greatest technology leaders on earth. If you do what great leaders do consistently over time you’ll be seen as a great leader. Opportunity will open up and you will get to the next level. How do you show that you have improved as a leader? How can you communicate that you are a great leader to someone who doesn’t know you? Leadership has been intangible until now. As your actions compound you build up a powerful tangible track record of your growth as a leader. No more cold courses or being directed to a half-alive forum for people to “help”. In our level up program, you’ll have a dedicated leadership advisor who will guide you through the entire level up process step by step so that you’ll level up by the time you complete the program. After your application is accepted, you’ll meet with a leadership advisor and begin your onboarding process. During the onboarding process, we will get to know you and your specific situation. Who are your colleagues, your stakeholders, how do you communicate value, what are your current responsibilities, where are you today exactly and where do you want to be? All the questions that we need to position you for success in your transition. Next you’ll begin with a leadership strengths assessment which determines your areas of strengths as a leader. In our program we’ll focus building you up on the essential areas and building upon your strengths. This is unique and personalized to each individual. After the onboarding process is complete you’ll begin your first leadership challenge. These are weekly interactive video challenges that will grow you as a leader. Each challenge features a famous CTO like the CTO of NASA or Microsoft who you’ll learn from directly. Each challenge comes with advice from a great leader, an action item that you perform immediately following the video and extra credit to keep the process fun. After the challenge you’ll make an entry into the Reflect DB where you’ll get feedback each week directly from your leadership advisor. We are always here for you every single week during this program to ensure your success as you level up. No, we only accept people who are driven and who successfully complete the program application. Apply here. 10 minutes per week and a 20 minute call with a leadership advisor every 6 weeks. You are expected to set aside 10 minutes per week to perform each challenge and be on time for your leadership advisor meeting every 6 weeks. What are examples of the challenges I’ll be completing? From giving credit, to communication and strategy, we have a wide array of challenges. The challenges you’ll receive will be specific to your needs from the personalization in the onboarding process. You won’t have any trouble completing the challenges due to difficulty. We’ve put 100’s people just like you through these challenges and are confident in your ability to execute them. Remember, we have an application process so we never accept anyone who isn’t capable. If you’re accepted into the program we’ve determine you have exactly what it takes to thrive in the program. Can I see some of the challenges before joining the program? Absolutely here is a sample of the challenge “Giving Credit” keep in mind that it’s a single challenge sample for you to see the format. The program is tailored to you and builds overtime. Keep in mind that these challenges are just one component of the overall program experience. Can I see what the interface of the program looks like? Sure! Here are a few screenshots of the system. What features do you have to ensure my success? Helps ensure your accountability by reminding you when you miss challenges as well as keeps you motivated by continually showing you how you hard work has compounded throughout the program. Yes, you’ll be meeting with a real person every 6 weeks to go over your progress and that same person will be engaging with you each week as you complete your leadership challenges. Providing you feedback every step of the way. The purest most effective content in existence. We’ve sourced all of our content from the world’s leading experts. These individuals all started out as individual contributor and are now running billion dollar corporations. This allows you to get to where you’re going fast and efficiently. They leveled up, and so will you. Individual contributor gets rejected then becomes team lead. Jason is an individual contributor with strong technical skills but wants to advance and keep growing in his career. Deep down Jason knows he has a greater potential than where he is at today. His boss stat him down to deliver the bad news… Keep reading Jasons story. Jason: I didn’t get promoted and I was suppose to be, instead they hired someone from the outside to lead the new team. Why was I passed up? I was frustrated venting about this to a friend of mine on the other side of town. He told me to checkout the ModernCTO podcast. I started listening to all of these great leaders who had made the transition from individual contributor to leaders of these large companies. Then I heard a guest on the podcast talk about how they use LeaderBits to level up their people. I watched a few videos about the program and then decided to meet with one of the Leadership advisors. I was hesitant from the cost of the program but then realized it’s about what I pay for personal training so I just saw this as training for my career. The only difference is that if it worked I’d make more money and that isn’t true for hitting the gym. Meeting the the Leadership Advisor was fun, I got Allison as my Advisor. She asked me about where I’m at today and where I want to be. She learned about my exact situation, who was on my team, who the leaders where I report to. Then she developed a strategy so that I keep showing them value and improvement consistently over time so that the next time an opportunity came they would know i’m capable and i’ve been working hard for it. Onboarding went smooth, I began taking action with the challenges immediately. The 2 leaders I report to were skeptical at first, but they were happy that I was doing more than my peers. About week 6 they became flat out impressed with my commitment and progress in the program. 3 months after starting the program Kevin and Nick came to me and said another team was opening and they would like to offer me the position instead of hiring externally. I was ecstatic, and a bit surprised that it actually worked. But from a logical perspective it makes sense. Because they could see my capabilities and desire to grow and improve they were confident in my ability to lead. Without making my ability tangible I was just another team member that “wanted more” but had not done anything to showcase my abilities for the role. That’s why i’m grateful to have found LeaderBits. Now i’m in a higher level program and plan on moving from team lead to managing multiple teams. Abigail was comfortable running a team, but now she’s managing people who manage teams with 20+ people under her. She’s not slowing down anytime soon, but she needs some help mastering this new level. Keep reading abigail’s story. I was in year 3 at my company had gotten to a good level managing my own team and 2 others. But during the growth we brought in a lot of “top people” from big brands that made it more difficult for me to advance quickly. How can I compete for a “engineering director” against a form Uber and Google employees the recruiters keep bringing in? Poking around the site I found a video talking about how to level up. The video talked about how to get experience at the next level without holding the position. It made sense and gave me a new perspective. I decided to give it a shot and signed up. I met with a leadership advisor Jim who was professional and friendly. We discussed everything about my company, my teams, my story. He really understood who I was and what I wanted. The best part is I didn’t feel alone or like I was beating my head against the wall. I felt like I had someone on my team now to support me on my journey. I began the program which is based on weekly actions and then meeting every 6 weeks with Jim to check on the progress. The program is completely customized to me which I really like. I also enjoy “LeaderBot” which holds me accountable, reminds me when i’m falling behind because work got too busy and I forgot to do a challenge. After 7 months in the program keeping the value in front of my leader I still wasn’t leveled up and was starting to get nervous. However looking back on the 28 weeks and challenges I had completed I felt amazing and confident in my abilities It’s amazing how my experience compounded so fast. I met with Jim to share my frustration and he agreed I was ready. So we developed a strategy for me. We determined exactly how I would leverage my Reflect DB entries for an official “Ask”. I was incredibly nervous but Jim coached me and prepared me. I went in for the “Ask” to my CTO, confidently with a strategy and my track record of growth. Mark, my CTO was impressed. Scanning over my documents nodding up and down. He said “Okay, let’s level you up, I’ll need a day to figure out the details and get an offer together.” We shook hands and the following week I had a raise, a handful of new responsibilities along with a new title Director of Platform Engineering. How much does the Level up program cost? We have a financing program that cost $150 more but allows the following payment schedule: 50% down + payments over 6 months. Will my company pay for this? Most employees have an “education budget” they can choose to spend on this. We highly suggest you apply first and get accepted into the program. In our experience it means more if you pay for the program out of your own pocket, then after the first 3 months show your progress and ask for the reimbursement. Why? You look more capable and serious to your company when you take your development into your own hands. When you put your future into someone else’s hands you lose the ability to control the outcome. Apply today and guarantee that you level up. What happens if I get rejected during the application process? If you’re application is rejected we will give you feedback on why and provide you with free resources to help you prepare and grow. You’ll also receive a suggested timeframe to re-submit your application. Who made this program, can I trust it? Joel Beasley, the host of Modern CTO interviewed 230+ technology leaders from around the world and found the exact steps to get from one level to the next. Yes, you can trust the program. The CTOs of great companies like Microsoft, Verizon and NASA trust Joel. You can apply to the program here. It takes about 1-2 business days for your application to be reviewed. Can I speak to Joel directly? During the onboarding process you can request to have Joel present to say hello and ask any specific questions you may have. Is this program for me, Is this made for technologists? Yes, we specialize in leveling up people who work in technology. From software, IT, support desks if you are working in a technology company or technology department we can get you to the next level. How many people have you leveled up? We’ve leveled up 100’s of people. Here is a video testimonial from Jere who leveled up. You’re in control of your future. Each application requires $25 deposit which is applied to your program cost or fully refunded if your application is not approved. This weeds out people who aren’t committed to taking the next step. If you are serious about getting to the next level, now is the time to take action.